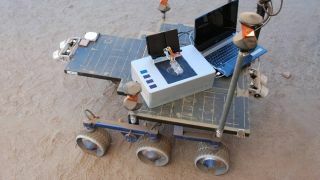 NASA's new "chemical laptop" perches on a test rover at the Jet Propulsion Lab's Mars Yard next to an ordinary laptop. Such a laptop could detect signs of life on other worlds. This could be "an especially useful tool for icy-world targets such as [Saturn moon] Enceladus and [Jupiter moon] Europa," said Jessica Creamer, a NASA postdoctoral fellow based at JPL. "All you would need to do is melt a little bit of the ice, and you could sample it and analyze it directly," she said in a statement. The device uses technology similar to an espresso machine to analyze a sample. It picks up a liquid or ice sample, puts it in a tube with liquid water and heats it above 212 degrees Fahrenheit (100 degrees Celsius). Then, it mixes the sample with a fluorescent dye that attaches to amino and fatty acids. Like left and right hands, left-handed and right-handed amino acids are mirror images of each other. The molecules have the same elements attached in the same order, but since they mirror each other, they’re fundamentally different. A microchip inside the laptop separates left-handed and right-handed amino acids so scientists can determine the ratio. Researchers tested the chemical laptop last year at JPL's Mars Yard, a simulation of the Martian landscape. They'll do another test soon in the Atacama Desert in Chile in preparation to send the laptop to other worlds like Mars and Jupiter's moon Europa.